Offices have truly transformed since the days of fluorescent lighting, cubicles, and water cooler breaks. As more and more evidence surfaces linking office aesthetics to employee productivity and happiness, businesses of all sizes across all industries are embracing office design as a key element of company culture. But there is more to be said for a well-designed office than just ergonomics alone. The design of your office interior is a powerful way to reinforce branding and professionalism. The most iconic brands of our time sell more than products, they sell lifestyles. And the best way to convincingly sell a lifestyle is by living it yourself. When you design your company values into your office space, you are making a conscious decision to demonstrate brand integrity and adherence to company principles. Are environmentalism and sustainability central to your company mission? Then ensure that your office is outfitted for energy efficiency, and incorporate reused and recycled materials into the design wherever possible. Does your business espouse transparency and open doors? Then etched glass meeting rooms and an open floor plan could work in your favor to promote open dialogue and the flow of information. Your office space is a representation of your business’ core values. Don’t let poor design detract from what makes your company unique. Your business logo is hugely important to your brand and recognizability. But even though your logo is the most important piece of imagery for your brand, it should not be an overbearing theme in your office design. Not only does it look tacky, but it can dilute the effect of the image. But there is a subtler way to incorporate your logo into your office interior: breaking the image down into its most basic geometric shapes. Polygons are incredibly versatile in architecture and design. Work these shapes into textile patterns to use for curtains, carpeting, or furniture. Use composite materials like Dibond to create sleek, geometric surfaces to use as desks or shelving. These strategies can help you achieve visual unity without logo-overkill. Nothing is a better representation of your brand than your products and services, so let them speak for your company! Displaying prints that showcase your work will both highlight your achievements and add some branded visual interest to your office space. Does your company sell consumer goods? 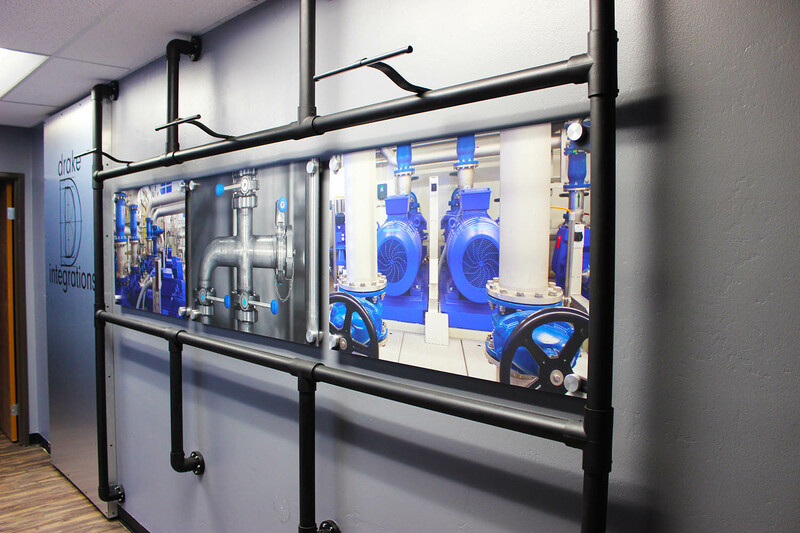 Then consider hanging a series of acrylic product photos or design blueprints in your lobby. Is your business more of a consulting firm or a non-profit? Display artful prints of projects in which your team has been involved. Of course, not every company has a product or service that is particularly photogenic. But even if the day-to-day realities of your business don’t translate well to photographs, prints can still be used as a means of decorative branding. A surgeon’s office, for example, might choose to display tasteful anatomical drawings in their waiting room. Creating an office design that is on-brand is about marrying form, function, and outside perception. Few brands want to be perceived as “in your face,” so opt for designs that tastefully reinforce your brand instead of screaming it. With a beautiful and expertly branded office space, your business can reap the benefits of elevated professionalism, productivity, and workplace satisfaction. Joe Robison is the Marketing Director of Coastal Creative, a San Diego-based printing company. He and his team work on all sorts of projects from vehicle wraps, to wall murals, to canvas photo printing.